There is only one question, when confronted with the spectacle of two plucky food critics tucking into the first-ever lab-grown beefburger: would you eat one? There is certainly much to be squeamish about. The meat was grown in a petri dish from stem cells extracted from two dead cows’ shoulders. The small strips of muscle tissue duly produced were then made into pellets, frozen and, ultimately, squashed together into a burger — at a gourmet cost of nearly £250,000. Nor is non-meat meat a taste sensation. Without a mechanism to make flavoursome fat, the white and tasteless patty relied on breadcrumbs, saffron and beetroot juice for its verisimilitude. Not very appetising, then (although the tasters were more forgiving than normal). But that is not the point. For all its short-term shortcomings, the lab-burger is still a giant step towards a less stretched yet better-fed world. Not only are modern factory farming methods hardly less revolting or more natural. Even such ruthless intensity cannot provide the quantity of meat that an ever-richer world demands. Animals, cows in particular, use up vast amounts of resources and produce huge quantities of climate-changing methane. With a global population of seven billion and rising, meat for all — or even most — is impossible. 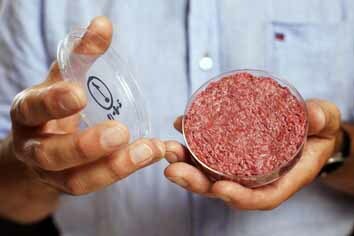 Lab-grown beef might have a long way to go. But to have come even this far is a triumph of human ingenuity and of hard scientific graft. It is also a welcome knock to the reactionary anti-stem cell lobby. Another burger? Yes please.